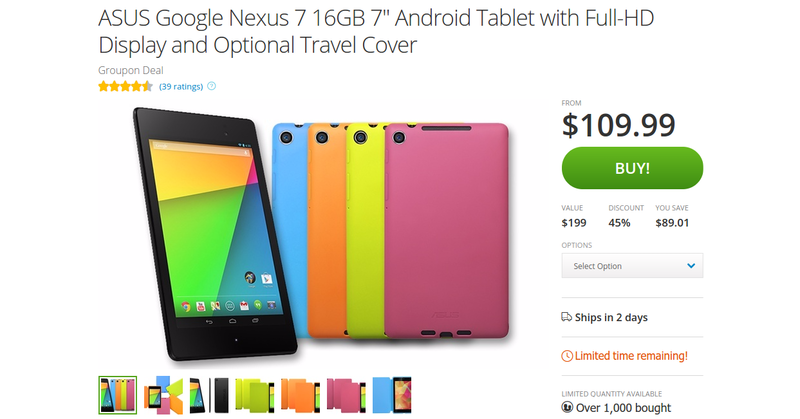 Want a 2013 Nexus 7? If you're still getting your 7-inch Nexus devices confused, think of this as the good one. Grabbing one now may be a much faster way to get Marshmallow than waiting on an update. A few weeks ago Groupon offered the device for a mere $124.99. Well, now the site only wants $109.99. That's a $15 price drop in less than a month. Just like the last time around, you can get an optional folio case for only $5. It comes in your choice of blue, greenish yellow, orange, or pink. There's only a limited time left to jump on this deal. Once you place your order, it will ship in two days, just so long as you live in the contiguous 48 states.